Pivotal has decided to merge Cloud Foundry's container technology with Docker's. I'm delighted to be working on this project with my friend and colleague Steve Powell. This blog sketches our initial thoughts. Steve and I have been exploring how to improve CF's Warden container component to make it a suitable base for future maintenance and extension. Warden is functionally rich, but needs some improvements in robustness, diagnostics, testing, and so on. Rewriting Warden was initially attractive, but would be unlikely to gain much traction in the open source community. Reusing Docker's container technology turned out to be the best option. 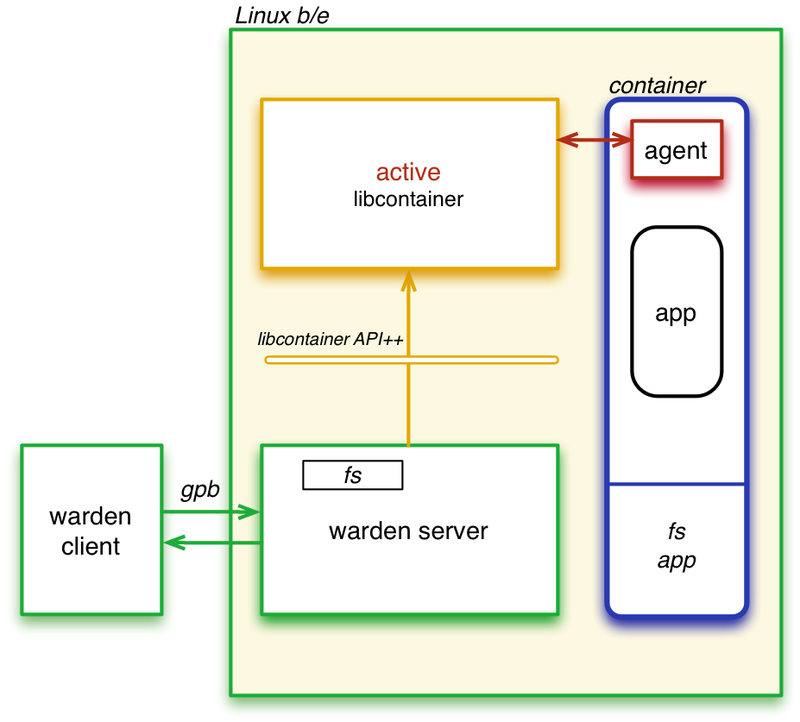 Now that Docker has split out the libcontainer project, basing a new Warden Linux backend on libcontainer is feasible: CF will benefit from container backend improvements in libcontainer and libcontainer will be strengthened by supporting the CF use case. Detailed container management is delegated to a warden backend. There are backends for Linux and Windows. 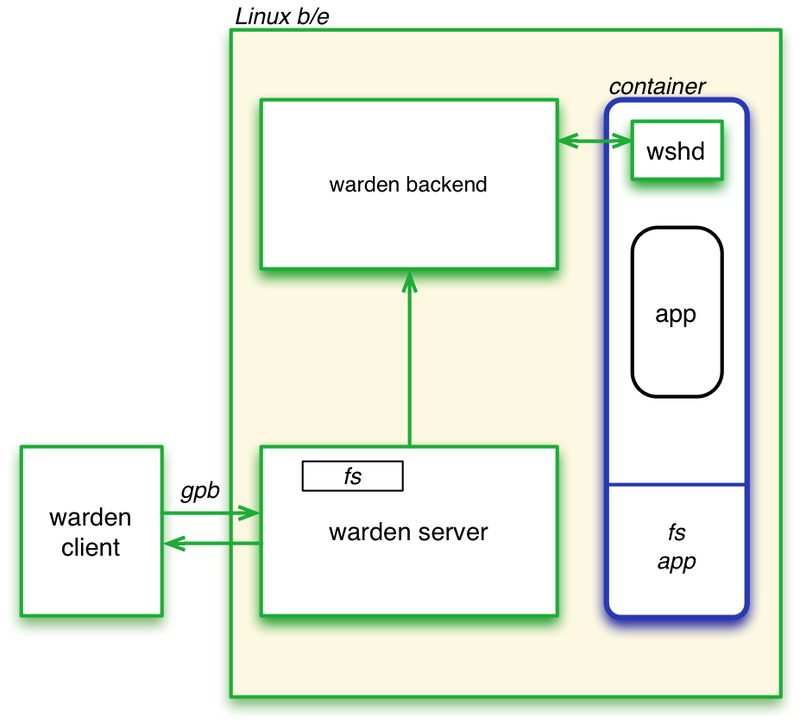 The Linux backend creates containers each of which contains a warden shell daemon (wshd) which is responsible for managing applications and performing other functions inside the container. The backend connects to wshd via TCP/IP using a file-based socket. The container is implemented in terms of Linux primitives such as namespaces and control groups. libcontainer implements its containers in terms of similar Linux primitives to those used by Warden: namespaces, control groups, etc. non-functionally - to improve robustness, maintainability, and serviceability. We'll replace the existing Warden Linux backend with a new Warden backend based on the extended libcontainer. 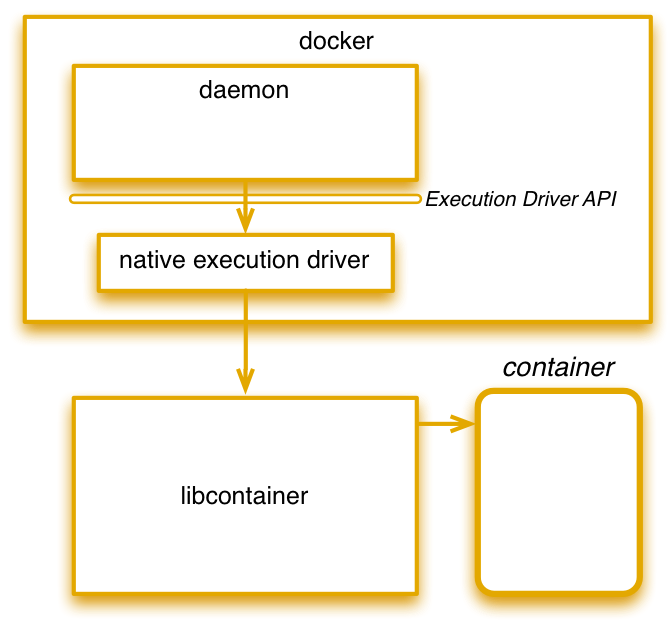 We hope that Docker will also be able to exploit the extensions to libcontainer, for instance by exposing new monitoring, management, and diagnostic capabilities. Note that the libcontainer API does not yet exist, but is currently being proposed and discussed. Although initially it has been decided that security group changes will require an application restart. The idea of making security group changes to a container on the fly is a future enhancement our organization is very interested in. In a previous post of yours (2) you mention that one of the advantages of Warden is its dynamic configuration capabilities. Do you think the move to libcontainer will hurt the ability to have dynamic CF security groups in the future? No, not as far as I can tell. 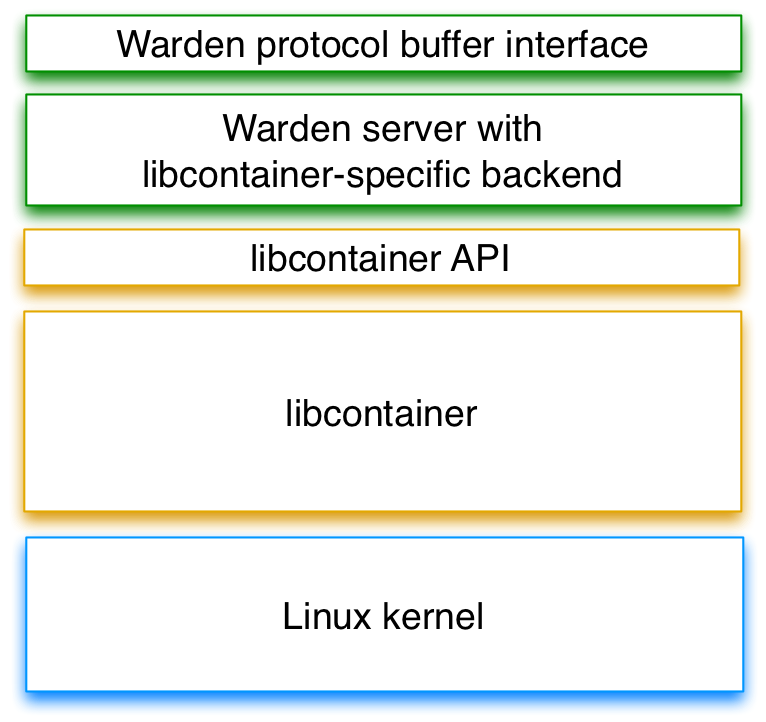 The technologies underpinning libcontainer are the same as those underpinning warden, so they should both be capable of supporting the same sorts of changes, at least in principle. Clearly there is a bigger community in libcontainer/docker to approve any change, but also the benefit of more eyes to spot mistakes. OTOH, there may be some practical constraints that get in the way. libcontainer's function is a bit broader than warden's with some support for SELinux, for example, which is likely to complicate any security changes. Also libcontainer seems to be designed to conform to systemd and is also looking towards exploiting the croups unified hierarchy when that ships, so these may also have implications for how easily security groups can be managed. However, even if warden had kept its own container implementation, there were requirements to support SELinux (in order to make some potential exploits more difficult) and also at least tolerate unified hierarchy, which may have drawn warden in the systemd direction. If these requirements had been satisfied by warden, then warden and libcontainer would have had similar complications for the kind of security changes you describe. 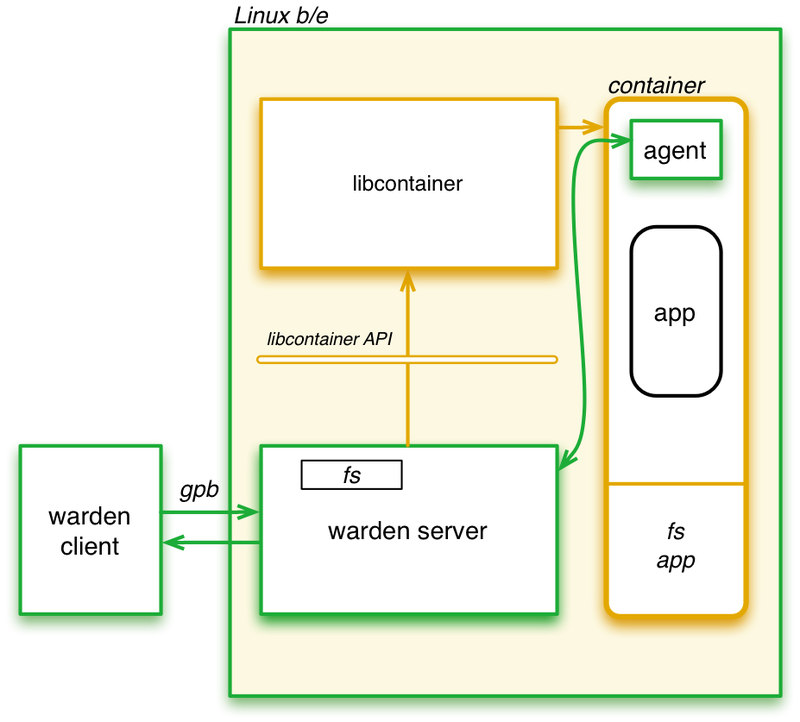 Essentially, warden and libcontainer are at similar levels of function and are subject to similar future requirements. Perhaps you'd like to review the libcontainer API proposal and suggest how to ensure security group changes can be supported in the future? I would take a look at the api proposal but it would be way over my head. :) All I know is that as an end user I want to be able to change what a container's network interface can and cannot connect to without recreating/restarting the container. If that isn't possible under the selinux constraints that's fine. Otherwise it would be nice if you could keep that use case in mind as you continue this work. Great post and thanks for sharing your plans. Are you going to lend a hand to support unprivileged containers? We'll be focussing mostly on bringing the libcontainer API up to parity with warden, so I guess that means we will be interested in unprivileged containers. One thing that is not quite clear to me is whether you guys are going to embrace the docker packaging format as well. IOW, would I every be able to use a Docker registry as a GitHub of sorts for managing the applications that my organization deploys to CF? That's not on our (Steve's and mine) immediate radar, but I believe some work is going on elsewhere to add dockerfile support to CF and this may involve the docker repository. Probably best for you to ask on vcap-dev. Is this change included in Diego project? I remember in the Diego's architecture, "Garden" will replace "Warden" which means warden is re-written in Golang. Is it still the plan? In Diego, the Ruby code of Warden has been replaced by Go to form Garden (which is a Warden server minus a backend) and the Warden-linux backend. The Warden-linux backend combined with Garden replaces Warden. Apologies that the terminology is a little confusing! Re-basing Warden-linux on libcontainer is a longer term item. I don't know whether the Diego project will run long enough to include the libcontainer work.